Both the American eel and the European eel, two closely related species, inhabit rivers and lakes many miles inland on their respective continents but are born in the ocean. We know this because juveniles coming from the ocean inundate rivers in the spring, and the smallest, youngest eel larvae – shaped like transparent leaves with eyes and teeth – have only been found in the southwestern Sargasso Sea. From the Gulf of Mexico to the Gulf of St. Lawrence, mature dark silver eels are seen migrating out of rivers and into marine waters. They must congregate somewhere in the Sargasso Sea to produce the seasonal surge of larvae carried by the currents to Atlantic coastlines. However, adult eels have never been seen or captured in the Sargasso Sea and nobody knows the routes they take or signs they follow to get there. Without knowing where to look, the odds of catching deep swimming, nocturnal eels in a sea roughly the size of Australia are pretty slim. While ship-based surveys revealed the presence of eel larvae beginning their journey in the Sargasso, researchers are now creatively using technology to piece together the journey of adult eels. Adult eels beginning their migration from the St. Lawrence River in Canada have been tagged with data-collecting devices that recorded surprising behavior, said lead researcher Mélanie Béguer-Pon, who works for both Laval University in Quebec City and Dalhousie University in Halifax. She began tagging eels in 2010 and recently published several papers describing the first of her team’s findings. Eels are most active at night and make their migration slowly, traveling out of estuaries on ebbing tides to swim less and save more energy for the long journey ahead. Should those Canadian eels make it to the Sargasso Sea, they may encounter a bright yellow glider named “Anna” cruising up and down through the water. Anna is an autonomous vehicle programmed to travel a specific route through the ocean for weeks at a time, constantly collecting data for scientists at the Bermuda Institute of Ocean Sciences (BIOS). “The eel monitoring group saw our glider, recognized its potential to contribute to their program, and sent an email,” said Ruth Curry, the physical oceanographer who runs the new glider program at BIOS and was happy to attach an instrument to Anna to detect any Canadian eels passing by. The hope is that in the course of her own Sargasso Sea sojourns, Anna may end up in the right place at the right time to gather clues about the secret destination of eels. The Canadian researchers hope Anna will detect “pingers” that have been surgically implanted into eels. 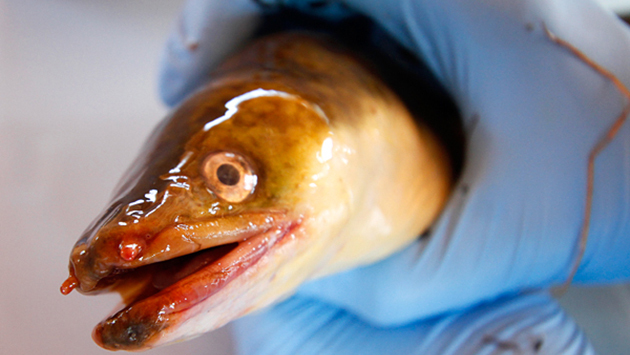 Eels purchased from commercial fishermen get a rare second chance to complete their migration, but only after being anesthetized by scientists, equipped with a little battery-operated acoustic transmitter in their abdomen, and stitched up. Upon release the eels return to their single-minded task of getting to the ocean, all the while emitting a signature 69Khz “ping” every two minutes. Against the background noise in the ocean other animals probably don’t register this sound, but arrays of hydrophones stationed along the St. Lawrence River and stretching across the Cabot Strait will pick up the sound of any eel passing by within 500 meters. The recorded pings from 89% of tagged eels enabled Béguer-Pon and her colleagues to document the eel behaviors that they recently reported. Species such as salmon, sturgeon, and sharks have been acoustically tagged by other scientists, and are also recorded as they pass the hydrophones. All these studies are all part of the Canadian Ocean Tracking Network, a joint endeavor between government and academic scientists to study the behavior and habitats of threatened species. Of course, it would be difficult to have hydrophones throughout the entire Atlantic, especially without any idea of where eels might travel between Canada and Bermuda. Having Anna outfitted with an instrument that records the signature sound of eels offers a potential solution to this problem, although Curry is still working out kinks in mounting the device after pressure changes snapped the first mount. The other potential eel-tracking solution may be pop-off satellite archival tags, which are externally attached to animals. These tags record environmental data like temperature and depth over the course of weeks and months before popping off at a pre-programmed date, floating up and relaying the data to a satellite. Béguer-Pon and her collaborators have tried that approach as well, but with a small number of eels since satellite tags are more expensive. Nearly all of Béguer-Pon’s satellite-tagged eels were eaten before they ever left the Gulf of St. Lawrence, a tale told by the tags when the temperature record suddenly switched from cold seawater to the internal temperature of a tuna or shark! Remarkably, because both tuna and sharks in the region had been previously tracked with satellite tagging, recorded swimming depths were used to identify the eel predator as a porbeagle shark. Although the loss of the tagged eels so early in their migration was disappointing, the study highlighted the consistent role migrating eels might play in ocean food webs and gave eel researchers food for thought: in the study of North Atlantic porbeagle sharks that provided the swimming behavior data, satellite tracking had also revealed that pregnant porbeagle sharks swam over a thousand miles in deep, cold waters to birth their pups… in the Sargasso Sea. While any relationship is speculative, it does show how little we know even about our “coastal” species. While scientists continue to question how eels travel to the Sargasso Sea, they know the numbers of eels in many areas are declining and that the numbers of juvenile eels entering a river can vary greatly from year to year. A study conducted in Ontario waters found the number of eels arriving from the sea have declined by 97% since the 1980s. Along the Hudson River, where citizen science volunteers have been counting juvenile eels since 2009, the number making their way upstream each spring has ranged from an average of 20 per day in some years to approximately 200 per day in other years. The forces behind these variations are poorly understood. Land-based culprits are partly to blame: water pollution, dammed rivers that interfere with migrations, and the lucrative fishing industry are some of the most widespread and pernicious. But the ocean is also intimately involved in the success of eels. Cyclical changes in North Atlantic ocean currents have been shown to impact how many juvenile European eels making it to the coasts. Without knowing what route eels take, it’s also difficult to determine how changing ocean temperatures and chemistry may impact eel populations. As with any small sample taken from the gigantic ocean, “This is still a shot in the dark,” said Béguer-Pon. But as the saying goes, it’s often darkest before the dawn. New technologies have the potential to illuminate hidden ocean processes and ocean dwellers. Listening, rather than looking for eels, may also expand our understanding of these creatures and the fascinating ways they connect land and ocean ecosystems.